How to Fix “Right-click to run Adobe Flash Player” or “Couldn’t load plugin” Problem With Facebook Games And Other Flash Apps – Useful tips and tricks, tutorials, workarounds, fixes, downloads and much more! Are you suddenly unable to play your favorite FB game any more? Or trying to watch some online video but player is unable to load? Instead of content you’re getting blank space with short message saying “Right-click to run Adobe Flash Player” or “Couldn’t load plugin“? This usually occurs if your browser doesn’t have a Flash Player plugin installed or it does but for some reason, plugin stopped working (most common scenario). Adobe Flash Player is a very popular Chrome plugin developed by Adobe. 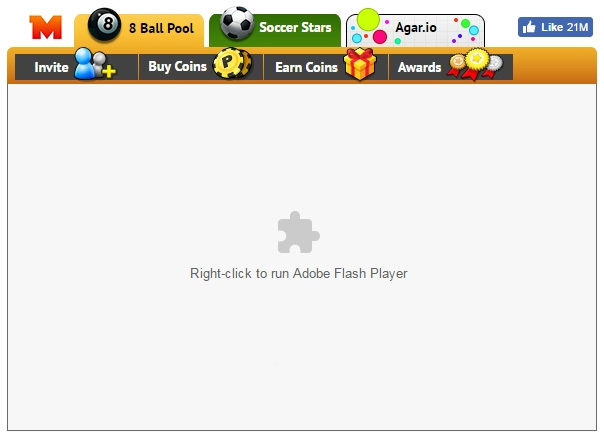 Although it is the most commonly used for browser games (flash games) and online video players, many online applications are using flash technology. But sometimes, Adobe Flash Player browser plugin suddenly stops working, and besides Google Chrome, it may also happen in Firefox, Internet Explorer, Safari and any other browser. So if you have Flash browser plugin installed but you’re still unable to run flash apps, the solution is to install Adobe Flash Player system plugin from the official Adobe Flash Player page. 2 On the right side of page, you’ll see the link to Adobe Flash Player system plug-in. Click on it and you’ll get Install now button. 3 Unselect all optional offers such as McAfee Security Scan Plus and True key by Intel Security, cause you don’t need these. 4 Click on Install now and download Adobe Flash Player Installer to your desktop. When download finishes, close your browser. 5 Run the installer, leave Allow Adobe to install updates selected and go through the rest of installation process.